Let us drive you to the Iron Maiden – Legacy Of The Beast Tour 2019 event with the 20% off when using Promo Code EVENTS20. We can accommodate a group from 1 to 100 plus passengers using our luxury vehicles. 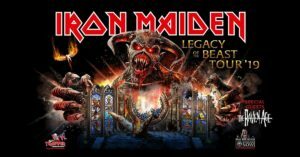 Book your car now for the Iron Maiden – Legacy Of The Beast Tour 2019 event. Our Customer Experience team is always happy to answer any questions and help you make any last minute adjustments. Terms & Conditions: 20% off select regular-priced service. Some exclusions may apply. Offer is valid for a limited time only, while supplies or offer last. Offer cannot be combined with any other offers or used on previous purchases. DC Livery has the right to end any promotion at any time. Other restrictions may apply. Discount has no cash value. Void where prohibited, taxed or otherwise restricted by law.